Designers, happy Spring Break! We hope you enjoy your week off and get some well deserved rest and relaxation in after an amazing Exhibition. Friendly reminder that there is no class in session on Monday, April 22. Classes will resume on Tuesday, April 23. We will see you then! First of all we would like to thank all of you who have attended the Exhibition Nights this week for the three high schools. As some of you may have been made aware of, we experienced a malfunction on Wednesday afternoon with our main elevator resulting in four students being stuck inside. Fortunately, they were all assisted out of the elevator unharmed by the El Segundo Fire Department. The elevator was closed down and the elevator company had already dispatched a technician to address the problem. After servicing the elevator, we were informed that it was ready to be put back in to service. Staff from our maintenance and security department tested the elevator to make sure it was operational and no problems were encountered during those tests. Unfortunately, during the DVD Exhibition Night, we experienced another malfunction with the elevator that resulted in ten people being stuck in the elevator on the first floor. Fortunately, the El Segundo Fire Department responded to our call and again provided assistance getting everyone out unharmed. Our thanks go out to them for their quick response and professionalism! As a result of these and other recent incidents, several additional measures are being put into place before putting the elevator back into service. Some of these include a message to all of our staff and students with instructions on what to do if they encounter a problem related to the use of the elevator. Protocols regarding the use of the elevator are also being reviewed to ensure that is only used by students, staff, and guests who are supposed to have it available for use during the school day and any school events. Furthermore, we are working directly with the elevator manufacturer regarding these incidents and conducting a thorough investigation into the reasons for the malfunctions in order to take all the necessary precautions to avoid this from happening again. We sincerely apologize for any distress and inconvenience that these incidents may have caused and will work diligently to continue to maintain the highest measures of safety for your students, our staff and all of you at the Da Vinci Schools. Should you have any questions about matters related to these incidents, please do not hesitate to contact our Mr. Vicente Bravo, Da Vinci Schools Chief Administrative Officer, at (310) 725-5800, extension 1308, or by email at vbravo@davincischools.org. Designers, next week is Exhibition week! We can’t wait to see all of the amazing projects you’ve been working on so diligently. Families, we look forward to seeing you on Wednesday, April 10 from 6:00-8:00 pm for Exhibition! Please allow ample time for parking. Please note that Friday 4/12 is a minimum school day and we will be in session from 9:00 am – 1:30 pm. Spring Break is April 15-22. Class will resume on Tuesday, 4/23. Interesting in applying for summer internships? Time is running out! Please see THIS POST for more information. Parents, if you are interested in being part of our hiring process for potential Da Vinci teachers at one of the 3 high schools, please sign up at the link HERE! 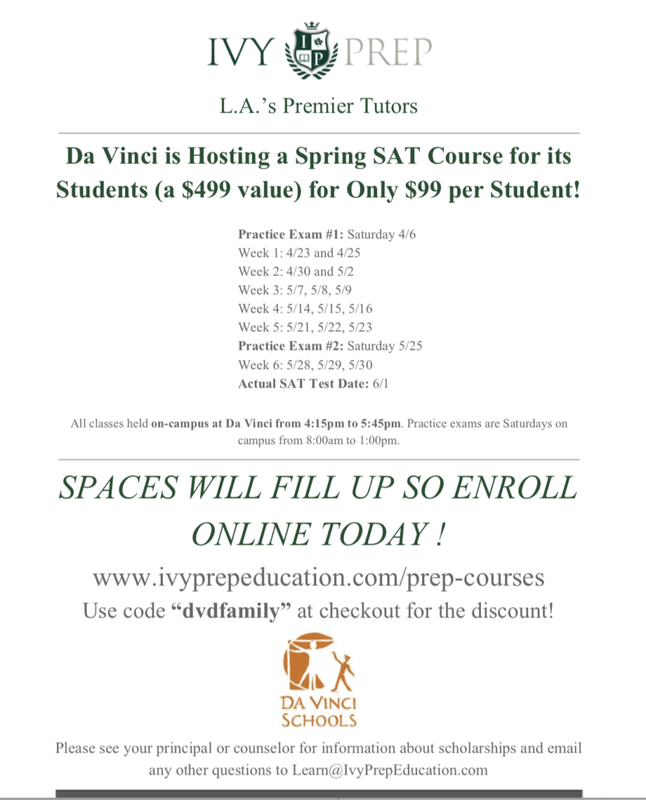 Da Vinci Design parents – if you are interested in being part of the hiring process for new teachers at the 201 site for the 2019-20 school year, this is your chance! Please sign up at THIS LINK if you are interested in and available for one or more of the time slots provided. See post from Mr. Stoll for more details. Wednesday, April 10 form 6-8 pm. We look forward to seeing you there! Designers, this is your final chance to enroll in an SAT prep course after school this school year! The initial practice exam will be held on Saturday 4/6 from 8:00-1:00 on campus and courses start Tuesday 4/23 (after spring break). More details in the flyer below. Sign up now at the link below for this deeply discounted prep course while space is still available!